McDonald’s French fries: An entire load of boxed, frozen McDonald’s French fries spilled across the side of the 5 Freeway in Irvine, California, on March 25, following a truck accident. KABC-7 reports that traffic was not affected, but the driver was unable to recover any of the shipment. 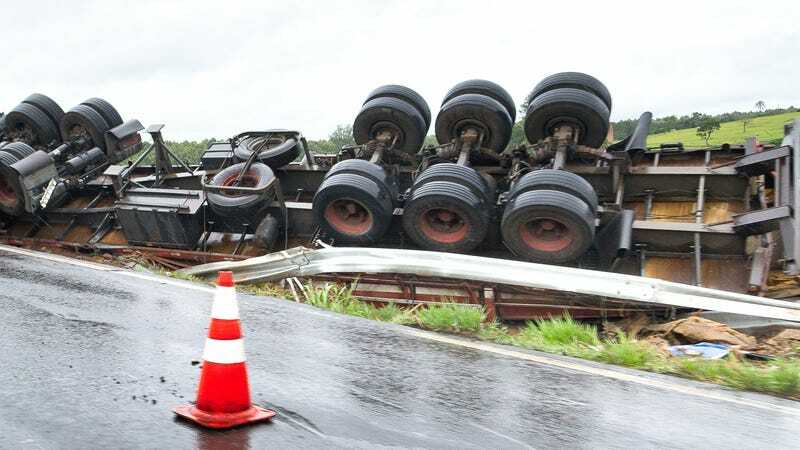 Miller beer: An overturned truck transporting Miller beer blocked all northbound lanes on Highway 75 in Melissa, Texas, on March 6, Fox 4 News reported. The semi truck leaked beer, oil, and fuel across the roadway and a hazardous materials clean-up team had to be dispatched. Busch beer: In an incident unrelated to the Miller spill above, a truck carrying what appears to be Busch beer tipped over on March 7 in Okaloosa County, Florida. An estimated 30 tons of canned beer littered Interstate 10, WKRG reports, and the truck driver was subsequently cited for reckless driving. Milk: A40 Over roundabout in Gloucester, England, was temporarily closed after an overturned truck scattered crates and jugs of milk across the busy thoroughfare, the BBC reports. Numerous terrible spilled milk puns were also reported. Salt: As plows battled snowy conditions in New Jersey in early March, a salt truck tipped over in the town of Swedesboro as it followed an interstate off-ramp toward a New Jersey Department of Transportation yard, Fox 29 reports. The truck was reportedly filled with salt at the time of the accident. Strawberries: A semi-truck carrying strawberries overturned and caught fire March 10 in South St. Louis County, spilling 70 gallons of fuel and presumably, some fruit. Eastbound Interstate 255 was temporarily closed as authorities responded, KMOV reports, and the entire load of strawberries was ruined.